Where am I? 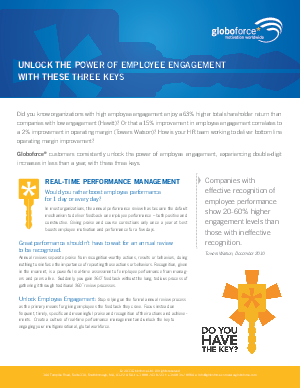 › Home > White Papers > Globoforce > UNLOCK THE POWER OF EMPLOYEE ENGAGEMENT. See how companies with effective recognition of employee performance show 20-60% higher engagement levels than those with ineffective recognition. Learn why organizations with a global approach to recognition indicate staff around the world felt more interconnected. Turbo-charge recognition by capturing and amplifying all the goodwill across your organization. Get all the good of social media with none of the bad.